When you survey the landscape. There have been a number of significant hints that MLB and the Major League Baseball Players Association are headed for some very combative collective bargaining in 2021, but the two sides being willing to talk about economics ahead of schedule will stand out to anyone who has ever been through this kind of negotiation. Ordinarily, the money stuff gets discussed after the rest of a collective bargaining agreement is settled. If the two sides already agree on the need to figure out the massive problems with free agency and the like, years before either side needs to come to the table, it suggests that both know they’re in for a prolonged fight, and that an economics discussion will need to start sooner than later if they’re going to avoid the likelihood of a work stoppage when the current CBA expires after the 2021 season. That conversation is not as simple as “free agency needs to be fixed,” either. MLB’s economics and player compensation concerns point in a number of different directions, and free agency can’t be solved in isolation. With that in mind, here are some key economics items for that could help MLBPA address baseball’s economics while also helping to make free agency viable again. Arbitration is vital to making baseball’s economic system work. It imposes a one-on-one negotiation between team and player, and also a solution should that negotiation break down: a third-party arbitrator who can rule that one side or the other is being ridiculous in their demands. Other sports have restricted free agency for younger players, but while that might work for the NBA, where nearly every team is hovering near the salary cap (or using every convoluted legal measure possible to exceed it), far too many MLB teams don’t want to be even $50-75 million near the luxury tax. Arbitration, hobbled by overt league-directed collusion though it may be, can force teams to spend money they have even when don’t want to. If MLB attempts to institute restricted free agency, as they did during the 1994 strike, the Players Association should react as they did 25 years ago and reject it. At least this time around, an active collective bargaining agreement would force the owners to suggest the idea rather than simply enact it. Restricted free agency is a bright-line, non-negotiable no-go: the issue in the market at the moment is that teams aren’t bidding on free agents, so instituting another round of free agency isn’t going to do anything to help player salaries. This goes double if it comes at the expense of the one arena in which players can argue for whatever compensation they feel they deserve. When owners tried to institute restricted free agency by fiat back in ‘94, theyalso attempted to kill arbitration outright. The argument was that both arbitration and free agency simply didn’t exist anymore, because they weren’t in the league’s original CBA. It was a new spin on an old goal—owners weakened arbitration in 1985 and demanded further weakening in 1990, and have never quite given up on the idea. Arbitration is not completely in teams’ hands, unlike the other compensation systems in the baseball economy. The owners have never been able to stand that. The collapse of the free agent market has also created problems in arbitration, because arbitration values—the salaries submitted by teams and players, and the standard by which the arbitrator judges them—are dependent in part on projected free-agent value. If free agency is no longer a financial windfall for players below the Bryce Harper/Manny Machado tier of superstars, arbitration prices will likely go down as a result. This means that team-friendly extensions like those signed by a number of young stars this offseason could become the norm. By letting teams buy out their arbitration years and some early seasons of free agency, those players are almost certainly leaving some money on the table. 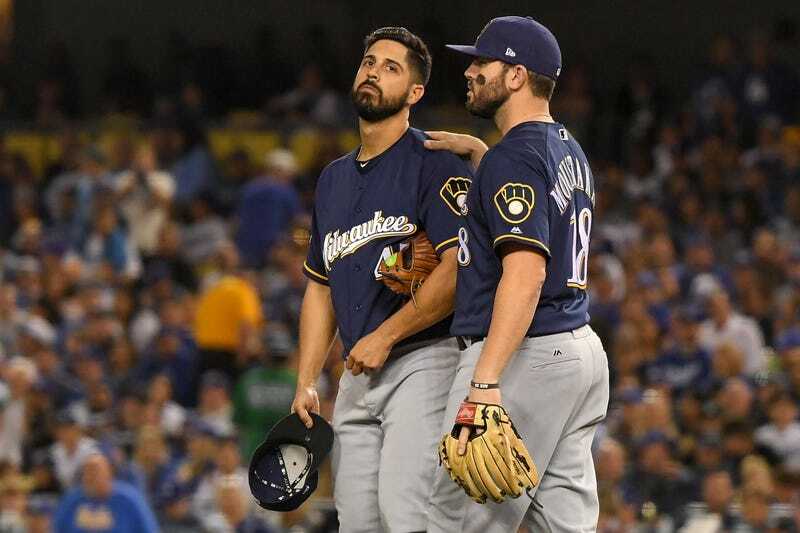 But the alternative is either going unsigned entirely like Dallas Keuchel or Craig Kimbrel or living year-to-year like Mike Moustakas, a two-time All-Star and reliably above-average player who has nevertheless become the avatar of MLB’s declining middle class. Now that free agency has shriveled, arbitration is the lone (and dwindling) point of leverage for players. To fix that distortion, and stabilize what has gone wobbly in baseball’s labor economics, what’s necessary is more arbitration. For players, that means winning back one of the concessions they made back in 1985, which started the arbitration process after three years of service, instead of two. The deeper pool of cheap pre-arb players that resulted made it easier for teams to sit out free agency; winning back that extra year, and giving players the right to arbitration after two years instead of three, would undo much of the damage from that concession. By reducing the number of pre-arbitration players in the league at any one time and giving players more time to build up their salaries through arbitration, the players could build a higher and sturdier floor for players who are not yet free agents. Some of this already happened during the 1990 lockout, with MLB making it so 17 percent more players would be arbitration-eligible than were after 1985’s tweaks. That was obviously not enough. As it currently stands, players are in a bind when it comes to fighting service time manipulation. The grievance that Kris Bryant filed against the Cubs for keeping in the minors at the end of the 2014 season and the start of the 2015 campaign to ensure they’d squeeze a seventh year of team control out of him is still pending, which has left teams free to give the same treatment to prospects like Ronald Acuña last season and Vladimir Guerrero Jr. this one (and arguably last year as well). Service time is easily exploited, and the incentives to do so are easy to see—FanGraphs’ explainer page on service time rules from 2011 is caught between praising the obvious efficiency of CBA exploitation and remorse at championing that notion. One full year of MLB service time is 172 days, and only 172 can be counted in a single year. So, 5.171—that is, five years and 171 service days—is a representation that a player is one day shy of six full years of service. That one day means the team has another entire season of that player at their disposal. The service time manipulation game is played out for more than just one day of the regular season because there are more than 172 service days in a season. Teams need to make two-plus weeks vanish to ensure that they get that extra year; if they also want to delay arbitration eligibility, they can hold down a prospect such that they end up with under 2.130 years worth of service time at the end of their third season. Waiting until June usually does the trick. It’s all very easily exploited, especially when all a team has to do to get away with said exploitation is say a prospect’s defense needs work, or that the vegetables are healthier in Buffalo than they are in Toronto and Vlad Jr. really needs to focus on eating them right now. What constitutes a full year of service time has to change in these economic discussions, and change by enough that teams can get away with punting a few weeks to start the season. Even 150 days would change the equation, but it would be better to focus on an even lower number—at 125 or 100, say—while retaining the cap on days earned so that no player winds up earning nearly two service years over the course of one season. Teams won’t like this, but again, if free agency is going to be a dead end players will need to get paid somewhere. So let’s get those service clocks moving. MLB owners are not going to agree to raise the minimum to a point where it mirrors a healthy arbitration raise, but the minimum salary should, at the least, grow alongside MLB’s own revenues. The minimum as it stands follows an agreed-upon increase system each season, just as the luxury tax threshold does. This helps players earn an extra $10,000 during their pre-arb seasons even when their team is too cheap to give them a raise otherwise, but that’s about the size of it. If the minimum had instead been tied to revenue growth in the years since the luxury tax was instituted, it would have jumped from $300,000 back then to around $850,000 now, instead of the current $555,000. Remember, the union’s job is not just making sure that top-end players get their money. Those guys are going to be fine financially in the long run, as their careers will last long enough that they will either get the chance to be screwed by free agency or sign nine-figure extensions before that happens. For the vast majority of MLB’s players, though, that’s not how it works. The average career length of an MLB player was 5.6 years over a decade ago, with one in five position players sticking around for just one year; that was before this decade’s run on young began to push veterans out faster. The average league salary—that was $4.38 million in 2018—has been climbing almost without exception for the last 25 years, because of the mega-deals that the league’s elite sign. But the median salary, which is a more accurate portrayal of MLB’s 750 active players and their compensation, was $1.5 million in 2018. That figure has fallen every year since 2014, as has the number of players making at least $1 million. Bryce Harper and his superhuman successors are going to get paid, but everyone else will continue to get squeezed. Minor League Baseball’s working and living conditions are not a secret anymore, and MLB has belatedly begun to talk about bringing up the quality of both. This is the same MLB that spent millions lobbying Congress just a year ago to ensure that they could continue to limit minor-league pay, though, so it seems fair to assume the league will likely do the bare minimum required when it comes to getting people to stop noticing how horrendous things are down on the farm. If the MLBPA were to step up on behalf of their future members during the coming economic talks, it would be a huge help. That’s especially so if those conversations happen this far ahead of the planned CBA negotiations, as it would make it clear this issue really matters to the MLBPA. It should, too. If minor league players are better compensated, then one of the problems of shorter careers is ameliorated in turn. That’s key, because minor league careers are short indeed: there are 6,000 of these players at a time and just 750 MLB jobs, with 1,200 new players drafted each June and a bevy of international signings each July. To pay those 6,000 players a living wage of, say, $50,000 per year would mean cost each team about $10 million, plus additional payments for housing, food, and equipment. That’s crucial, too, because MiLB players are not just responsible for apartments they can’t afford and all of their meals, but for buying their own equipment. Pro-caliber gear isn’t easy to afford on the federal minimum wage of $7.25 per hour, without the possibility of overtime. It’s not any easier when you have to split a grotty apartment with five teammates just to have a place to live. These people should be paid more, and not just for the PR boost. None of these changes directly address the current issues with free agency in Major League Baseball, but that’s going to be difficult to do. Free agency was weakened by the owners over time through a gradual wearing away of alternative means of player compensation, to the point where free agency was the only avenue left for players to earn significant dollars. Now that free agency has shriveled, arbitration is the lone (and dwindling) point of leverage for players. MLB players should respond to this with their own wearing away: by fixing arbitration, ending service time manipulation, bringing up the minimum salary, and showing up for future union members and those who will never make it that far. It might be the only way to restore free agency to its intended role—with costs going up elsewhere, free agency might hold more appeal to teams once again, and might better benefit the players who are currently being worst-served by free agency—not just Keuchel and Kimbrel, but Moustakas and Gio Gonzalez and others stuck on contingent, lowball deals. Nothing has to be solved overnight, which is good because nothing ever gets solved overnight. That’s the point of starting these talks two years early. If the MLBPA is as serious about fixing MLB’s economics as their members’ public comments suggest, then they should be able to start making progress for the union members who are worst-served by the current system. Focus on the right things, and the rest should fall into place. Marc Normandin is the former MLB Editor of SB Nation, and currently writes a newsletter on baseball’s labor issues and more for Patreon subscribers. His baseball writing has appeared at Sports Illustrated, ESPN, Sports on Earth, and Baseball Prospectus.